A Tennessee man is suing after an e-cigarette exploded in his face and tore part of his left cheek off. In the lawsuit, David Bishop, 25, of Cordova, said he was using the device at home before heading to work one morning in May 2018 when, suddenly, the lithium battery exploded. The battery acid caused severe burns on Bishop’s mouth, face and hands, and broke several of his teeth. It also caused the flesh to tear away from his upper lip to his lower left cheek. The warehouse maintenance worker allegedly needed 65 stitches and had to miss work for several weeks, reported the Memphis Commercial Appeal. Bishop filed the lawsuit against three companies involved in selling the device and the batteries in October 2018, which was transferred to federal court in February. The lawsuit states that the vaping device Bishop was using was a VGOD Pro Mech 2, which retails anywhere from $45 to $95. Bishop is seeking damages from VGOD, a company that sells e-cigarettes; Create A Cig Cordova, the store where he bought the device; and LG Electronics. In court documents viewed by the Commercial Appeal, Create A Cig argued that it doesn’t make the vape devices or batteries and that Bishop assumed any risk when he bought the e-cigarette. Neither company named an action Bishop performed that may have caused the explosion. Electronic cigarettes, or e-cigarettes, are are devices, often resembling cigarettes, cigars or pipes, designed to deliver nicotine or related substances to users in the form of a vapor. E-cigarettes contain a solution that’s heated up and converted to an aerosol, which is then inhaled. Proponents have touted that e-cigarettes are healthier, safer alternatives to traditional tobacco products. Research has found that the aerosol from e-cigarettes was significantly lower in toxins than from conventional cigarettes, although toxins could be detected. Additionally, those exposed secondhand were also at much lower risk from e-cigarettes than from traditional ones, though some risk might still exist. A January 2015 found that the cancer risk from e-cigarettes long term is estimated to be five to 15 times higher than that of smoking a pack of cigarettes a day, due to the toxic substance formaldehyde in the vapor. LG Electronics has filed a motion to dismiss, saying it does not make batteries but that its sister company, LG Chemical, might – which Bishop thinks makes the batteries – reported the Commercial Appeal. Lithium battery explosions are rare but, when they occur, they can cause devastating injuries. A 2017 report from US Fire Administration found 195 incidents of e-cigarette fires and explosions occurred between January 2009 and December 2016. Sixty of the incidents occurred while the device was being used. Additionally, there were 133 injuries – and 38 were severe. No deaths were recorded in the report, but at least two have been reported since. A 38-year-old Florida man died in May 2018 after a vape pen exploded and send two projectiles into his head and burned nearly 80 percent of his body, according to the Tampa Bay Times. And in January 2019, a 24-year-old man from Fort Worth, Texas, died after a vape pen exploded in his mouth and severed an artery in his neck, reported The Washington Post. Use of e-cigarettes has surged since they were introduced to the US marketplace in 2007, according to the Centers for Disease Control and Prevention. And they continue to be the most used tobacco product among US teens. This means e-cigs have surpassed cigarettes, cigars, chewing tobacco and other conventional products in popularity. 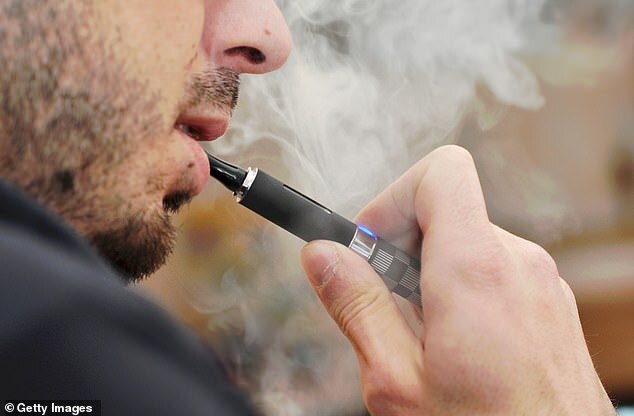 Bishop’s legal team says that e-cigarettes are different from other devices that use lithium batteries – like laptops and cellphones – because they’re put in the mouth. A jury trial for Bishop’s case has been scheduled for June 15, 2020, but a settlement could be made in negotiations before the date even arrives.